We dividend investors have one tool in our arsenal that makes the world of a difference over time: every time a company chooses to return some of its cash to shareholders in the form of a dividend, the price of the stock can fall a little bit, and investors can still tread water. The price of the stock can fall by a lot, and the investors will not lose as much money as you might think. Or, the price of the stock may rise by quite a bit, and the dividend may boost your total returns by a greater amount than what you can see by merely looking at a stock chart. This is something that I have been experiencing in real life with my investment in BP stock. The price of the stock has pretty much gone nowhere, but given my purchase price of around $40 per share, I am collecting a 5.4% annual dividend yield. To give myself the reward for stating the obvious, I’d like to point this out: the price of the stock could fall by 5.4% over the next twelve months, and I would still be in the same place nominally, because the current share price in addition to the total dividends received over the twelve-month stretch would allow me to tread water. Is it the goal of an investor to tread water? Probably not, but it important to keep in mind what your life can look like when you get past the “stock chart” mentality of only equating success with forward advancements in the price of your chosen stock. 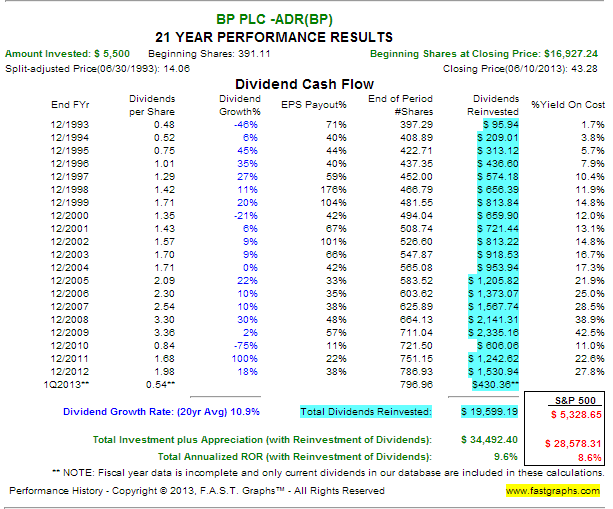 Consider the logistics of what it looks like if you collect four BP dividends at $0.54 per share, and then receive a 9.2% dividend increase to $0.59 per share quarterly next year. Someone with 100 BP shares (bought at $40 each) would collect $216 in total dividends at the $0.54 quarterly rate, and he would collect $236 in annual dividends in the next year following the 9.2% dividend increase. What are the implications of this? Those $452 in total dividends give you some breathing room for principal protection. Your initial investment of 100 shares at $40 per share got infused with “$452 worth of protection.” That $4,000 investment could fall to $3,548 for you to be in the same place, dividends included. Essentially, after collecting your eight dividend payments over the course of two years, you could see the price of BP stock fall from $40.00 per share to $35.48 per share for you to still have that $4,000 in capital. It is a little more complicated than that because you have to manually adjust for inflation to figure out whether your purchasing power held steady, but the larger point is that, with dividend growth stocks, those dividend payments can pile up over the years to give you much better total returns that can be readily apparent from merely looking at a stock price. I love a company like Berkshire Hathaway. It is a dream long-term holding. But with no dividend, what you see is what you get. If the price goes from $110 to $115 next year, you made money. If it goes from $110 to $105 next year, you have a paper loss on your hands. Companies that pay dividends are a shield against Mr. Market. The price can fall a bit for you to still break even. In the case of a company like BP or Royal Dutch Shell, the price could move absolutely nowhere and you would still reap 5% annual returns. That is what makes this so much fun. When you get past living and dying by the stock charts and start incorporating the dividends into total returns, you can get a better picture of how dividends play a role in protecting your principal over time. That is the ace dividend investors have up their sleeves. When you get 4-5% dividends from Conoco, Shell, and BP, you can be making a lot more money over 5-10 year time frames than a mere look at a stock chart might indicate. Despite the oil spill, you’d still be receiving a 28% annual yield-on-cost. If you looked at stock price alone, you would think that you only turned $5,500 into $14,893 over that time frame. But the company paid out a huge amount of total dividends over that time, just shy of $20,000. That is right. A $5,500 investment in BP would have given investors about 3.5x their initial investment in total dividends over the course of a twenty-year period that included a terrible oil spill that temporarily knocked the company off-kilter. Your $5,500 investment in BP would have actually grown into over $34,400 (as opposed to $14,893) when you factor in dividends that got reinvested over time. That is what can make dividend growth investing so much fun. If you just look at stock charts, it might not appear that you are making all that much money. The fact that BP tripled its stock price over twenty years probably sounds good, but not great. But when you count all those dividends that the company paid out over the past two decades, you can see that you received total returns (that is, dividends plus price appreciation) over 6x in excess of your initial investment. Those dividends are “invisible” to a lot of stock charts out there. But over long periods of time, they start to make all the difference in the world.